THE MATTEWS-NORTHRUP CO. -The Century Atlas. New Jersey. . . THE MATTEWS-NORTHRUP CO. - The Century Atlas. New Jersey. . . The Century Atlas. New Jersey. . . - THE MATTEWS-NORTHRUP CO. Title : The Century Atlas. 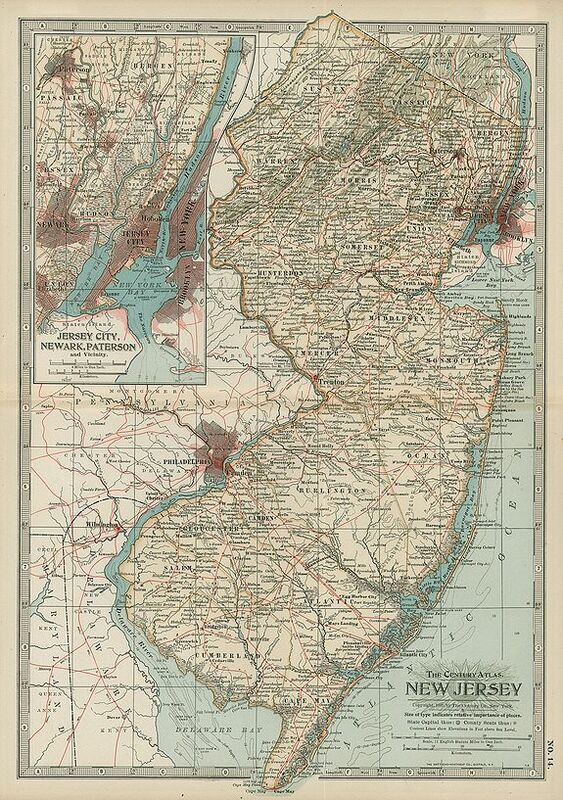 New Jersey. . ..
Map maker : THE MATTEWS-NORTHRUP CO.. Size : 15.0 x 10.4 inches. / 38.0 x 26.5 cm. Description :Finely detailed map of New Jersey shows counties, cities, townships, roads, railroads, rivers and lakes. A large inset map in upper left shows New Jersey City, Newark, Paterson with block plan of streets and the Hudson River. From the Century Atlas of the World. Prepared under the Superintendence of Benjamin Eli Smith. A colorful and attractive map.